Blog > Sock Club > Knitting Socks! Sock knitting has a reputation for being addictive, and rightly so – once you start, you really can’t stop! 1. Fibre – a blend is best! It is wise to stick to natural fibres for sock yarns, thanks to the nature of feet and perspiration! 100% Acrylic yarns do not suit feet very well, and you’re better off with something breathable. A blend is best – even a small percentage of nylon will help to keep your socks in shape and make them washable. Paintbox Yarns Socks is a hardy 75% super wash wool, 25% polyamide sock yarn that comes in four exciting stories: Zebra, Fair Isle, Stripes and Pixel, and each story contains seven fabulous colourways! West Yorkshire Spinners 4ply is a great favourite with ‘sockettes’ (sock fans! ), and Regia yarns are super popular worldwide thanks to their fabulous range of variegated colourways, and their yarns are hardwearing and will withstand lots of machine washing too! 2. Toe up? Cuff down? You can knit socks from the toe up, or the cuff down, and you can knit two at a time to avoid the well known “second sock syndrome” which affects sock knitters who never get around to knitting the second sock of a pair! It comes down to preference, there are devotees for both methods. These blog posts explore the methods: 4 ways to cast on a sock, Top down socks 101, but just make sure when you choose a pattern, that it uses the technique you prefer! If you get the bug, it’s great to invest in sock knitting books – I love Rachel Coopey’s Coop Knits Socks and Socks 2, both are chock full of beautiful sock designs. Her gorgeous sock yarn, Socks Yeah! is a fabulous sock yarn too, 75% merino wool and 25% nylon – it’s delicious to wear too! Rachel Coopey is the Queen of Socks! When you start out, a basic sock is the place to start, like this free pattern for Very Vanilla Socks by Jo-Anne Klim. Note the reinforced heel, and generous cuff – both easy to knit and a good place for starting your sock journey. We have thousands of sock patterns here at LoveKnitting, for all sizes and ages! Remember that you don’t have to start with fine sock yarn, you could choose a chunky sock like Dana Gervais’ Chunky Socks, or aran weight sock like Cosy Socks by Dream in Color, if the fineness of sock yarn is intimidating at first. It’s a good idea to begin with a baby sock, like Christy Hills’ Basic Socks for Baby, before you tackle adult sizes – this will let you practise the technique in miniature first. Explore our socks pattern selection here! Some people knit with double pointed needles, and some prefer the magic loop method using a circular needle with a long cord. 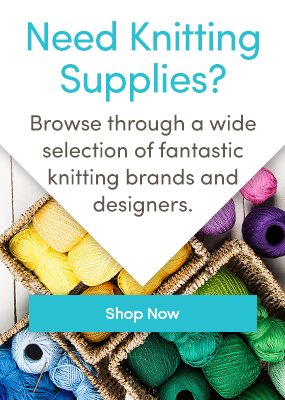 Needle material is important – choose something that will match your yarn and knitting style. Metal needles are great for yarns that are a little bit sticky, and they glide through stitches easily. This can also make them slippery, so if you are a new knitter and not confident with metal needles, try something with more grip. Bamboo and wood needles are perfect for slippery yarns as they have more of a grippy surface – ideal for cotton, bamboo and linen yarns, or indeed for new knitters who prefer a little bit more security with moving stitches. When you buy a set of double pointed needles, there are usually five in a pack – and this is because you will use four (occasionally three) to hold your work, with the stitches shared equally between them, and the remaining fifth needle as your working needle. You can read all about how to use double pointed needles here. If you’re a magic loop fan, you’ll need a circular needle of at least 100cm in length to keep the stitches pliable. Check out our sock knitting videos here! More to explore on the blog! How to turn a heel on a sock, 4 ways to knit a sock heel, Lilybet Socks Editor’s review, Socks Yeah review. 15 Responses to Knitting Socks! Thank you for the tips. I’m about to embark on my next project which is knitting a pair of socks. I’m hoping i don’t poke my eye out with the needles!!! Instead of knitting one sock at a time, what I do I knit two socks on a different needle for magic loop or a different set of double pointed needles. I will knit in units: the cuffs on each sock , one after the other; then the leg on each sock; then the heel, etc. No more second sock syndrome for me! I had tried the magic loop two at a time and it was great when everything was going smoothly but I had messed up and it was a real pain to backtrack and fix and so I never finished the socks. I do the same too, else I have one bigger than the other. Not very good at counting rows or remembering what I did where,lol. And its an effort to make notes as I knit along. Also do the same with gloves. I can’t get my head round the magic loop. I have just got the sock knitting bug and am on my fourth pair, there is a sock knitting club at our local wool shop which is where I started. I always remember my Grandma knitting socks but it was one thing she never taught me so I set myself the challenge. I consider myself lucky because I do not suffer from the second sock syndrome. I have knit many pairs of socks and will continue to do so. They are not cheap to knit here in Calgary but are so nice to wear and my family like them as well. I love knitting socks-I find it so relaxing and will definitely be investing in Rachel Coopey’s pattern books for more ideas. I’m lucky as well; I do not suffer from second sock syndrome either. I enjoy knitting socks, mostly top down socks; I find the heel shaping with top down much nicer than toe up socks. I’ve even designed a few of my own patterns; a bit frustrating at times but very satisfying. I love sox! Top down, pattern stitches…always have more than one pair on my needles: that way I am not at a short row heel or an intricate pattern when tv or friends share my time. I am the family sock source: nine gals from four generations pick up their sox in my from my collection! My advice: always knit two at a time; quit a pattern if it is not fun (start again with a different pattern); carry a ready-to-knit a cuff kit when you are out in the world….make sox fun! Patience and fun…it’s called sock knitting! I knitted a pair of socks (both at the same time) for my boyfriend but they didn’t fit him, I had tried a pattern that he had chosen so I was unfamiliar with it but then I knitted him a pair from a familiar pattern and I got the first pair. Hand knitted socks are a luxury that you have to experience to know about. I have been knitting socks for about 5 yrs or so, after my 20-something year old nephews said they loved them. At the time, they were doing triathlons, cross-country running, or the odd iron-man competition. They said the wool socks kept their feet warm when wet, didn’t cause blisters, & were soft & comfy. They didn’t want to ask for more socks as “they’re so much work, Auntie,” but I love knitting for them & after dozens of pairs, they aren’t so much work. This year I am doing a different pattern: Tin Can Knits has a FREE pattern called “Rye” socks using worsted weight yarn & a garter stitch panel down the front. They knit up So fast!! I made a pair for my sister last year & everyone raved over them. Great for cold Canadian winters! Three pairs done: 2 to go!! Is it possible to find out the sock pattern which was knitted toe up that Sian was knitting on Monday Makers Sock program last night? me with my toys but am going to try knitting a pair of socks toe up with turkish cast on just hope it works if it does I will not have any sewing up to do which is always a bonus. Going to try one of Wendy Johnson’s patterns has anyone done one of these?